Akonix Systems provides Unified Policy Management for organizational use of real-time communications. Akonix’s L7 Enterprise™ on A-Series appliances delivers policy management and enforcement, archiving, content scanning, and protection against spyware, viruses and worms for corporate use of real-time communications, including instant messaging, BlackBerry® mobile text/IM/phone, online conferencing, VOIP, and electronic fax. Quest Software, Inc., a leading enterprise systems management vendor, delivers innovative products that help organizations get more performance and productivity from their applications, databases, Windows infrastructure and virtual environments. Through a deep expertise in IT operations and a continued focus on what works best, Quest helps more than 90,000 customers worldwide meet higher expectations for enterprise IT. Quest provides customers with client management as well as server and desktop virtualization solutions through its subsidiaries, ScriptLogic and Vizioncore. 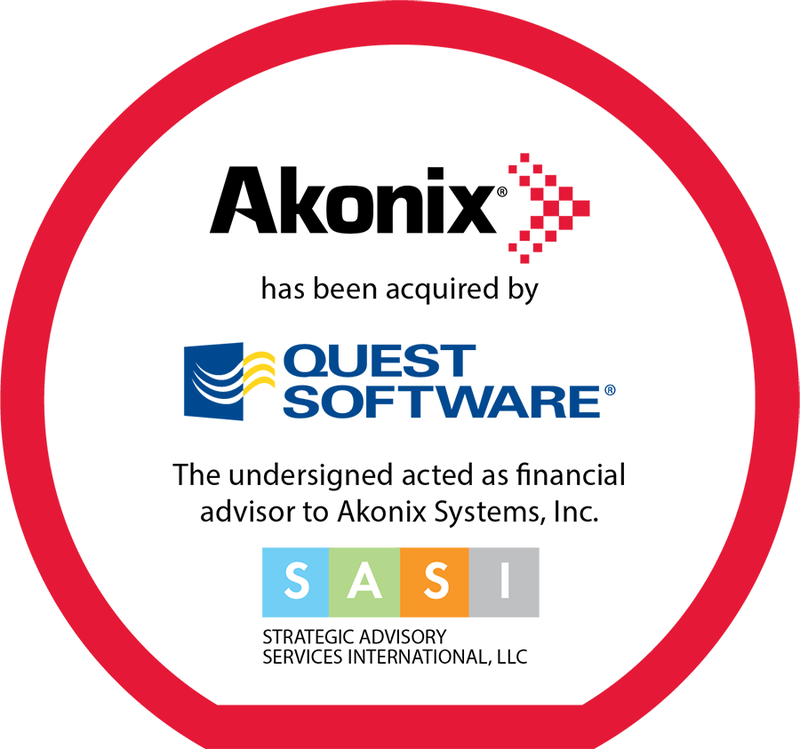 SASI had existing relationships with Akonix and the Board through previous transactions and 409A valuation assignments with Akonix. SASI drove the process from identification and selection of potential strategic acquirers through negotiations of critical deal points in the purchase agreement. Keys to success included understanding and articulating the core technology and value proposition, where it fits within the market and how it can be extended. Specifically, understanding and articulating the vision around policy based unified communications was critical. Business model analysis and related financial modeling also played a critical role.